-Southern Pacific #4460: the only War Baby Daylight left and herald of the end of steam on the Southern Pacific. -EMD FT #103: the diesel demonstrator that proved steam power could (and would) be forever replaced by diesel locomotives. 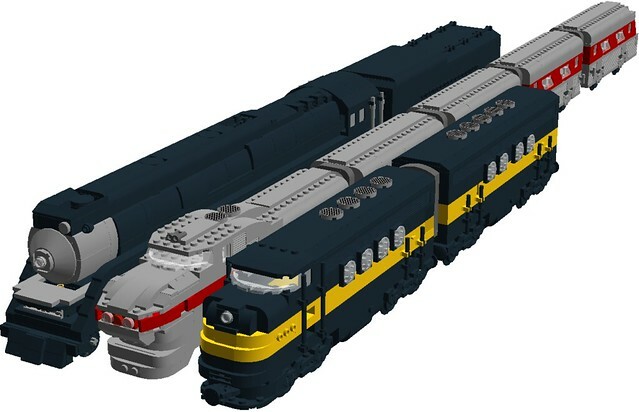 All three can be built in real life, and the LDD File is included at the bottom of this post. 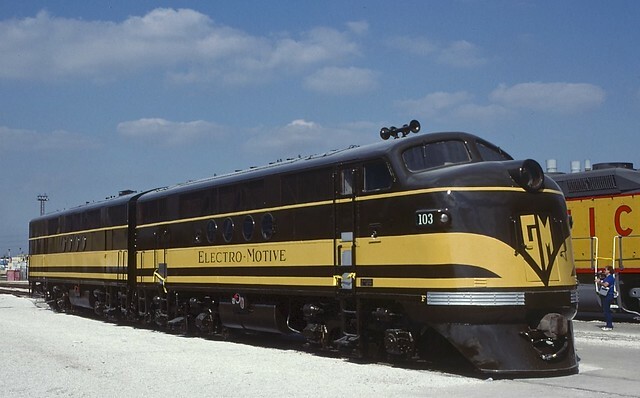 Built by General Motors (GM) / Electro Motive Division (EMD) in 1939, this is the diesel that showed the way to the future, signaling the start of the diesel era. However, as one day must start, another must end. This two A & two B locomotive set got the ball rolling towards the end of steam as mainline workhorses by pulling a modern two steam engines backwards - while said engines were at full forward throttle. Anyway, this particular engine was originally owned by Electro-Motive as a demonstrator. It was sold to Southern Railway and eventually placed in the Museum of Transportation in St. Louis, Missouri. It was repainted in it's original Electro Motive colors for it's journey to Railfair '91 held in Sacramento, California. It is currently on display once more in the St. Louis Museum of Transportation. The FT class eventually led to the entire F series, one of which is presumably the basis for the Santa Fe Super Chief engine in set 10020. This LEGO model features the the round porthole windows and no interior. The windshield is supposed to be the printed version from the Horizon Express. The three exposed studs on each of the nose sides are for tiles spelling out "103". Sadly, the B-Unit is now a rusted hulk, but the A unit is thankfully still in this pristine condition. 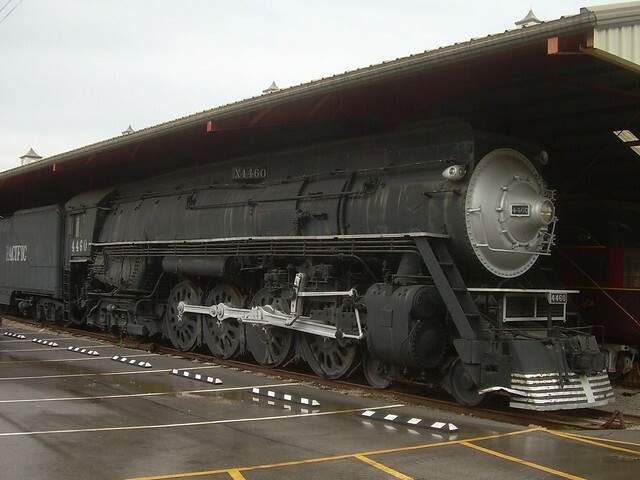 Southern Pacific 4460 is the only surviving GS-6 Class steam locomotive. The GS-6 is a semi-streamlined 4-8-4 Northern type steam locomotive. GS stands for "General Services". The locomotive was built by the Lima Locomotive Works for the Southern Pacific in 1943. The GS-6 lacked side skirting and red and orange "Daylight" paint found on previous locomotives of the GS class, and were painted black and silver instead. This was because the US government controlled locomotive manufacturers during World War II and had turned down Southern Pacific's order of fourteen new Daylight locomotives. Southern Pacific re-designed the engine for general service and it was finally approved, but the government took four of them and gave them to the smaller and power-starved Western Pacific Railroad Their smaller size when compared to previous GS class locomotives and the fact that they were built during WWII earned them the nicknames of "War Babies" and "Baby Daylights". 4460 is famous for pulling what was to be the final movement of steam on the Southern Pacific Railroad in 1958. Following the final excursion, 4460 was donated to the Museum of Transportation in St. Louis, Missouri, on April 16, 1959, where the engine has since sat along with many other historic steam and diesel locomotives from around the country. The 4460 is sometimes called the "Forgotten Daylight", referring to its only surviving sibling, the very famous Southern Pacific GS-4 #4449. The LEGO version is supposed to have Big Ben Brick XL 4 flanged & 4 unflanged wheels. The one seen here are placeholders. The studs on the cab and tender rear are supposed to have tiles saying "4460" on them, while the tender sides are to say "Southern Pacific". 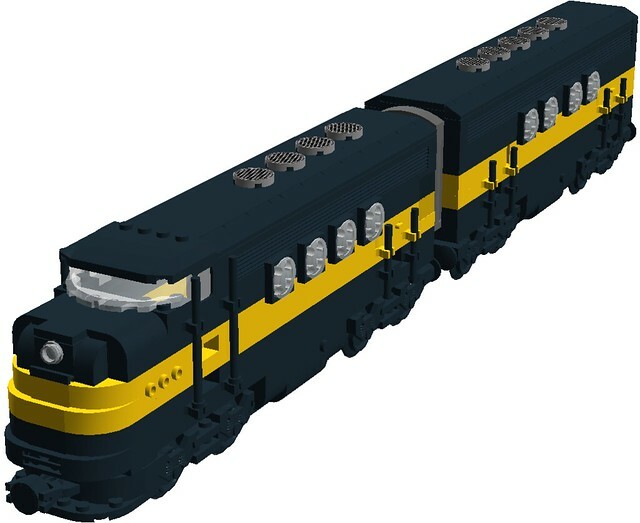 The Lego version is based on Anthony Sava's version of the GS-4 Daylight #4449, a related cousin of the #4460 and the only other Daylight left in existence. The Aerotrain was a streamlined trainset introduced by General Motors Electro Motive Division in the mid-1950s. Like all of GM's body designs of this mid-century era, this train was first brought to life in GM's Styling Section. Chuck Jordan was in charge of designing the Aerotrain as Chief Designer of Special Projects. It utilized the experimental EMD LWT12 locomotive, coupled to a set of modified GM Truck & Coach division 40-seat intercity highway bus bodies. The cars each rode on two axles with an air suspension system, which was intended to give a smooth ride, but had the opposite effect. The two Aerotrain demonstrator sets logged over 600,000 miles (970,000 km) and saw service on the following railroads: the Atchison, Topeka & Santa Fe Railway; the New York Central Railroad; the Pennsylvania Railroad; and the Union Pacific Railroad. Starting in February 1956 the Pennsylvania Railroad ran the Pennsy Aerotrain between New York City and Pittsburgh Pennsylvania, leaving New York at 0755; the round trip was scheduled 7 hr 30 min each way. From June 1956 to June 1957 it ran between Philadelphia and Pittsburgh. In 1956 Aerotrain No. 2 was leased as a demonstrator to the New York Central, and ran between Cleveland and Chicago. In March 1956 the Aerotrain made experimental runs for the Atchison Topeka & Santa Fe Railway in California as the San Diegan between Los Angeles and San Diego. Its use ended because the trainset had to be turned after each trip and it needed helper locomotives on the Sorrento Grade north of San Diego. Starting December 1956 Union Pacific ran the ex-New York Central Aerotrain as the City of Las Vegas between Los Angeles and Las Vegas. The train was eventually relegated to Chicago commuter service on the Chicago & Rock Island Railroad. GM's "lightweight with a heavyweight future" was introduced at a time when US passenger train revenues were declining due to competition from airlines and private automobile travel. 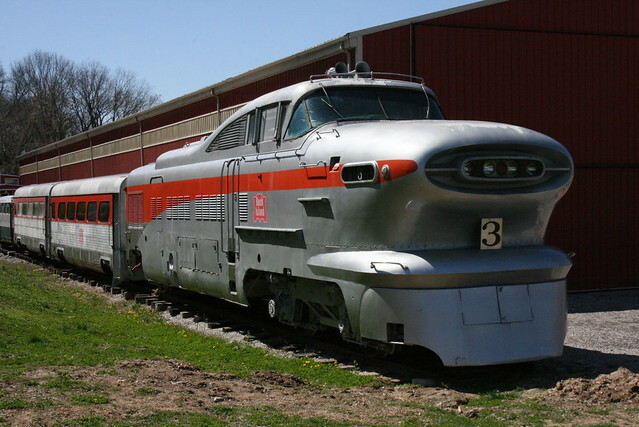 Although it featured a streamlined design, the Aerotrain failed to capture the imagination of the American public. The cars, based on GM's bus designs and using an air cushioning system, were rough riding and uncomfortable. The design of the locomotive section rendered routine maintenance difficult, and it was underpowered. Both trainsets were retired in 1966 after a decade's use. The Museum of Transportation in St. Louis, Missouri and the National Railroad Museum in Green Bay, Wisconsin each have one of the locomotives, and two of the cars. 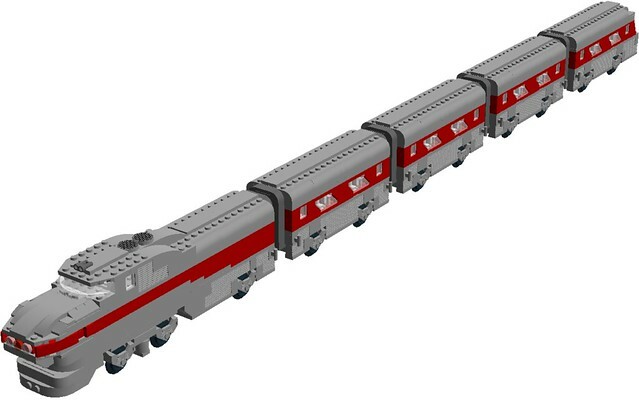 This LEGO version is to have a red number tile saying "3" (even though there were only two trains ever built! ) on the cab sides, and i'm not quite sure this will go around curves or switches. This version if based on a couple pictures I saw on Brickshlef. 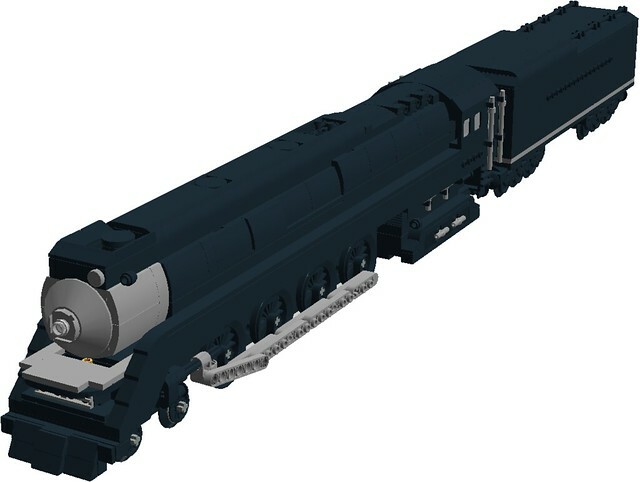 Oh, and the pieces on the front bogie between the wheels are CMF paint cans... has anyone else done that? Aerotrain #3 and it's two remaining cars from the original 10 car set in 2009 (photo by emzepe from Flickr. Link: http://www.flickr.co...s-dHVGkr-edHdNC ) Sadly, the other 8 cars were scrapped. The other Aerotrain set is in an enclosed space in Green Bay Wisconsin. Here we have them all together. Very nice! Having seen the real things up close, I would love to see these made, especially the Aerotrain. Hey! I just built the aerotrain last year (grin). Seriously though, nice build it looks great and you've just knocked the prototype on to my "think about building it myself" list. To get a few more windows on the cars, you might want to borrow the technique from my link on your bus train. On a side note, I don't know if the following is true, but I had heard stories that the aerotrain originally had a tv camera mounted in the nose and they would show the images in the cafe/lounge area. But after a few too many near misses at crossings, the railroad decided to turn it off.